Participating in the Joseph Kasierer Institute for Research in Accounting conference were senior female executives from international insurance companies and Dorit Salinger, Israel’s Commissioner for Capital Markets, Insurance and Savings, and a graduate of Tel Aviv University’s Coller School of Management. In the picture, from the right: Diana Laban, CEO of Aon Benfield Israel; Hava Friedman, board member of Harel Insurance company; Claudia Cordioli, CEO of Swiss Re in Western and Southern Europe; attorney Sigal Shlimoff, Lloyd’s representative in Israel; Morly Dory, CEO of Bituach Hakalai and Inga Beale, CEO of Lloyd’s of London. 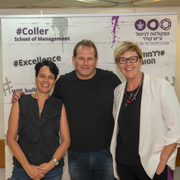 The conference on Management in the Insurance Industry from the Perspective of Women Executives was held by The Joseph Kasierer Institute for Research in Accounting at Tel Aviv University’s Coller School of Management and hosted a large number of senior female executives from insurance companies in Israel and abroad. The data presented by the Kasierer Institute showed that in Israel few female executives are members of the boards of directors or hold senior managerial positions in the large companies. At the same time, in comparison with the situation abroad, the percentage of female executives in Israel is higher, so that Israel is considered to be advanced on this issue in the area of insurance. In 2017, 25% of board members of insurance companies in Israel were female, a substantial improvement over the 13% in 2012. By comparison, an examination of the 100 largest insurance companies in the world showed an increase from 12% in 2012 to only 19% in 2017. The same was true of the percentage of women in senior executive positions –the data for the insurance industry showed 33% in 2017 for Israel and only 15% for the USA. These figures led to the agreement among the female speakers at the conference that the insurance industry still has to aspire to make significant changes in this area. The speakers claimed that, despite the slight improvement, as senior female executives they felt the need for change in the managerial arena of the insurance industry in Israel and abroad. The keynote speaker at the conference, Dame Inga Beale, CEO of Lloyd’s of London, related to the influence of the digital age, saying that in her estimation the digitization will help to close the gender gap in the workplace and affect the gender balance at the leadership level: “Our aim in the insurance industry and at Lloyd’s is to ensure that we are attractive enough to appeal to the younger generation.” Sharing insights from her rich personal experience, she said that female executives wishing to advance in their careers need to overcome their lack of self-confidence and learn to be assertive. It is also important, in her opinion, for them to express their wishes concerning their career advancement and development; otherwise their male counterparts will make decisions that don’t necessarily conform to their aspirations. Dorit Salinger, Israel’s Commissioner for Capital Markets, Insurance and Savings, and a graduate of Tel Aviv University’s Coller School of Management, noted that the insurance industry is ranked below the average on all parameters relating to diversification and wage gaps, and even though it has a large number of female employees the wage gaps between men and women are large. She believes that every effort has to be made to change the situation. The finding in an examination carried out by the authority that she heads that only 25% of board members are women led to the publication a few months ago of a draft proposal to promote more equitable representation. The panel discussion was chaired by attorney Sigal Shlimoff, Lloyd’s representative in Israel, who noted that there is no better place to host a meeting on innovation in insurance than Israel – a center of innovation and entrepreneurship. In addition to Claudia Cordioli, the members of the panel were: Morly Dory, CEO of Bituach Hakalai (Agricultural Insurance), Hava Friedman, board member of the Harel Insurance company and past CEO of AIG Israel, and Diana Laban, CEO of Aon Benfield in Israel. Morly Dory spoke about how impressed she was with Inga Beale when she heard her speak a few years ago at an insurance industry conference abroad. For this reason she felt it was important to hold a similar meeting in Israel. Hava Friedman said that in the past she had been surprised at the question posed to her by a journalist: “How will you survive in the male-dominated world of insurance where everyone is a shark?” Her answer had been that hard work is the key to success. Diana Laban noted the importance of personal management alongside professional management, particularly in the area of insurance, which is essentially a business of interactions amongst people. In summing up the panel discussions, the participants agreed that female executives in the insurance industry should undertake the role of leading and empowering the development of more women in the insurance industry in Israel and throughout the world. 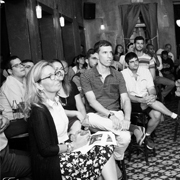 Prof. Yael Steinhart, head of the MBA program in Marketing Management at Tel Aviv University’s Coller School of Management, spoke about her research on the influence of the mode of advertising on consumers’ purchasing decisions – an issue that is also relevant to the area of insurance.